A few years ago, when I started training in martial arts, I dropped my hands whenever I fought. It was a terrible habit, and instructor after instructor would chide me about it: “Keep your hands up," they'd say. "Keep your damn hands up! Keep. Your. Hands. Up.” Still, for months, whether out of stubbornness or ignorance or simple exhaustion, I would drop my hands every time. Well, experience is the only teacher, they say, and no truer words have ever been spoken. After I’d been training for about a year, one of my instructors decided, I guess, that he was bored of telling me to keep my hands up and decided to show me the consequences of not keeping my hands up. So, one evening, a minute or two into a sparring session, when he saw me once again drop my left hand, he kicked me square in the face. The blow was hard—not hard enough to cause any real damage but hard enough to bust my nose open, wound my pride, and finally convince me of the virtue of protecting myself. My hands have been up ever since. At last weekend’s Friday Night Fights event at Terminal 5 in Midtown Manhattan, flyweight Stacey Scapeccia would have been wise to learn that lesson. Her short fight with New Yorker Ashley Miller was a demonstration of the one great immutable truth of evolution: Failing to adapt to adverse conditions is the best way to end up flat on your back. To describe the fight in any detail would be like describing the workings of a single station on an assembly line: After you’ve read about this mechanical arm driving that nail into this piece of sheet metal once, there’s really no reason to read about it again; you can trust that the same thing will keep happening. Miller, who trains in Krav Maga, an Israeli self-defense system that hasn’t found much success in MMA because it relies almost entirely on overwhelming opponents with strikes and doesn’t concern itself too much with things like strategy, did what she was trained to do: She came rushing across the cage as soon as the bell sounded and winged wild punches at Scapeccia’s head. Scapeccia responded well at first, throwing push kicks and round kicks to Miller’s legs and body to keep her away, but Miller just threw Scapeccia's legs to the side and charged forward. 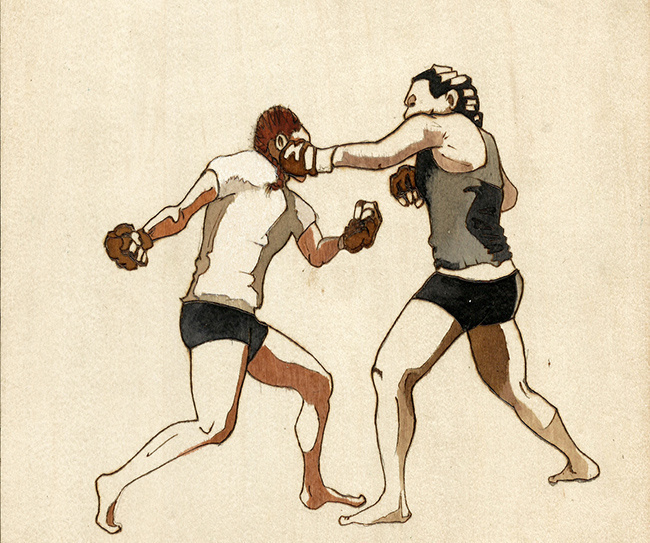 Five seconds into the fight, Miller threw a wild right hook that caught Scapeccia on the chin and staggered her, and the pattern was established: Scapeccia would throw out a lazy jab and leave her hand out too long and Miller would ignore it, load up a huge punch from way behind her body, and throw an overhand right at Scapeccia's head. Over and over Miller caught Scapeccia with that overhand right, barely bothering to throw any other punches or kicks--just overhand right after overhand right after overhand right. And still Scapeccia kept throwing that jab and leaving her hand out and not covering the left side of her face. And that arm kept driving nails into sheet metal. The ending, when it came, was predictable. One last solid cross counter from Miller sent Scapeccia to the ground and the referee to her rescue. The Connecticut native protested the finish but the ref was merely protecting her from the inevitable. MMA is too dangerous to allow for redundancy. Stacey Scapeccia has heart. She just needs to keep her hands up. To watch the fight, skip ahead to 11:10 here.